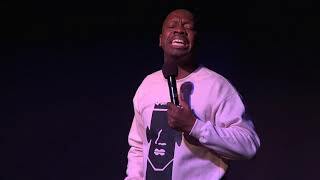 As a three-time champion at Showtime at the Apollo, Kareem Green is a multi-faceted entertainer and comedian whose talents include stand-up, Improv, acting and writing. Kareem's relatable comedic style has earned him television appearances on BET Comic View and TV-One's Bill Bellamy's Who's Got Jokes. Kareem has worked with Tracy Morgan, Bill Bellamy and Bill Burr. Kareem shares a wittiness that keeps audiences in stitches throughout the U.S., Europe and the Caribbean Islands about his experiences in foster care, fresh air fund, dating and having an extremely unsuccessful criminal career. As well as being an accomplished comedian, Kareem is a skilled actor and has had key roles in the independent films Gold Digger Killer, Holla If I Kill You and Comedy In The Hood. His headliner appearances at colleges and comedy clubs prove Kareem is soon to be a household name. Kareem has been featured at New York's top comedy clubs, including Carolines on Broadway, Standup New York, Gotham Comedy Club and the Comic Strip. He has received national recognition in nationwide comedy competitions such as Comedy Central's Laugh Riots and The Salem Orb Contest. And in 2009, Kareem was crowned Winner of the Bay Area Black Comedy Competition and the top finalist in NBC's Stand Up for Diversity. Kareem Green is, by far, a rising star!. With skill and determination, Jon Laster swiftly paid his dues and worked his way to now being one of Americas leading comedians. After leaving a lifetime of basketball, including High School All-American status and Division-1 college basketball, Jon jumped into comedy. In less than 5 years, he has worked some of the most popular and well-respected rooms across the country, including New York's Caroline's and the Boston Comedy Club, Comedy Works of his hometown of Denver. Jon also hosts his own weekly comedy night in Brooklyn, NY, where he currently resides. He recently appeared at Laphapalooza in Atlanta, Georgia. He has appeared on BET's "The Best of Comic View" every season for the past 3 years and is currently expanding his horizons in film and television.When asked what he wants for his audience, Jon replied, "My goal is to make people feel good and forget about or at least laugh at life's pressures, even if just for a few minutes. "And that's exactly what he does. Authenticity, with an equal mixture of laid-back and animated style is what makes this Denver native so intriguing.